William O’Neal is a man who sincerely loves God and God’s people. He was born to parents Teresa D. O’Neal (now Murray) and Willie B. O’Neal. He was raised in Hueytown, Alabama a suburban area near Birmingham. William was licensed to preach the Gospel and ordained to Christian leadership under Dr. Willie B. O’Neal & Dr. Patricia A. O’Neal at the Mt. Canaan Full Gospel Church in Birmingham, Alabama. He has been a leader in Christian ministry since 1994. 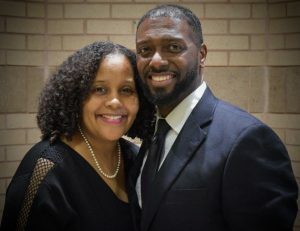 He accepted the call to ministry after graduating from the University of Alabama Birmingham with a Bachelor Degree in Social Behavioral Sciences. It was then that he began serving as Youth Pastor of the Mt. Canaan Full Gospel Church. During that time he created a teen ministry he named Y.W.V. (Youth With a Vision). Over the course of seven plus years through this ministry, he was able to inspire hundreds of youth and young adults to pursue a life of purpose by understanding and obeying the principles of God’s Word. William also served as Jr. Pastor of the Bethlehem Baptist Church located in South West Atlanta, Georgia under the leadership of Senior Pastor Dr. Carl H. Moncrieff. William is also a sought after inspirational speaker and human resources trainer in corporate environments. Through his inspirational presentations he consistently shares with many audiences the simple message of how to achieve greatness through service to others. He currently serves on staff as a Sr. Consultant Trainer with Emory University. He is a family man and happily married to the woman of his dreams the former Bridgette M. Carstarphen. They now live in the suburbs of Atlanta, Georgia where they are enjoying raising their family. They have been blessed with a son, William II and a daughter, Kenadee. They are committed to instilling into their children faith in the principles of God’s Word and a good sense of humor. William’s life verse is Psalm 1. First Lady Bridgette O’Neal serves as Administrative Pastor of Living Word Church Ministries. She is a woman who loves God and her family. Born in Tuscaloosa, Alabama to Sheila McGee Carstarphen and Hezekiah Carstarphen. Bridgette thanks her parents for instilling Christian values in her at an early age. But it was not until she went to college that she made a decision to accept Jesus Christ into her life and begin a personal relationship with Him. While attending Auburn University, Bridgette was an active member of a ministry called Ministries In Action. Bridgette graduated from Auburn with a Bachelor of Science degree in Business Administration with a concentration in Management Information Systems. After college she accepted a position in her field and moved to Birmingham, AL where she would meet her “dream man” and future husband, William O’Neal. She later became a stay home mother, raising their two children William II and Kenadee. She currently works as an HR Professional with one of Georgia’s premier organizations. However, her top priorities are helping and supporting her husband in ministry and raising godly children. Bridgette’s life verse is John 3:16.